It was over 45 years ago, on the 15th February 1971, that Britain went decimal. Gone forever were our much loved crowns, shillings and pence – no longer were there 240 pence in a pound. Pre-decimal coins are a public favourite, amongst these the iconic Thru’penny Bit, Britain’s most loved coin of all time. Proudly known as the first non-circular coin in British history, its 12-sided shape made it easily identifiable by touch, gaining favourability during the years of the Blitz when large periods of time were spent in darkness. Its timeless popularity with the British people was reconfirmed when the twelve-sided £1 coin was issued, paying tribute to the Thru’penny Bit in the 80th year since its first issue in 1937. 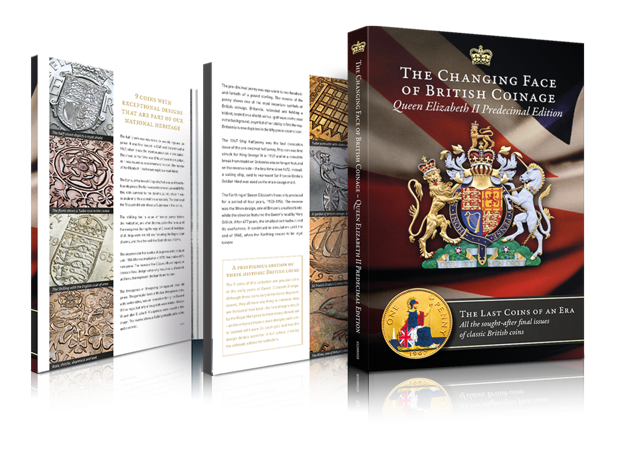 The London Mint Office is pleased to offer you access to a prestigious edition of the last-ever Thru’penny Bit in the limited edition Changing Faces of British Coinage: Queen Elizabeth II Pre-decimal Collection. Transforming the humble Thru’penny into the ultimate collectors’ edition, only the very finest examples of the last-ever issue bronze coinage have been selected and preserved for posterity, layered with pure 24 carat Gold. But what makes the Golden Portcullis Threepence the ultimate collectors’ piece is its exquisite colour accenting - with the main design gloriously highlighted in the red, white and blue of our Union Flag - a delicate and time consuming process, one that makes the Pre-decimal Threepence Piece even more special. If you act now you can secure this beautiful coin, the last of its kind, for just £9.95, a £20.00 saving on the normal price. Save £20 when you order today. Whether you remember the good old pre-decimal days with affection, or are looking to share the fascination of coin collecting with friends, family or even future generations, the Changing Face of British Coinage - Queen Elizabeth II Pre-decimal Edition, is an eternal reminder of the last pre-decimal coinage. Meticulously crafted, to preserve the memory of our last pre-decimal currency designs, this set enables you to own all nine of our most treasured Elizabeth II British coins, each lavishly plated in 24 carat Gold and accented in glorious colour. Whilst the first coin in the set, the Threepence, was one of our most iconic coins, the Shilling was perhaps one of our most important standard coins. Worth twelve ‘old’ pence, and with twenty shillings or ‘bob’ to the pound, the Shilling became the cornerstone of our old currency. Also included in the set are our much loved The Britannia Penny; the ‘lucky’ Sixpence or ‘tanner’; the Ship Ha’penny; Florin or ‘two-bob bit’ and the Wren Farthing. Minted at the start of Her Majesty’s reign, these are coins that, quite literally, belong to a bygone era. Don’t miss this opportunity to literally hold a piece of our history in your hands. There are many reasons this coin layered in 24 carat Gold, will be exceptionally popular. Not only is it an original, it also features the first effigy of the Queen to appear on our coins - as we reflect on Her Majesty’s historic reign, nothing could be timelier than owning a genuine coin from the beginning of her time on the throne. The first portrait of the Queen to grace our coinage was the work of Mary Gillick. Gillick was chosen from sixteen other candidates to prepare the new queen’s coin portrait. The artist’s delight in the young monarch is evident in her simple, uncluttered portrait – the only one to show the Queen without a crown. The youthful portrait of our young Queen perfectly reflected the optimism at the start of a new era in post-war Britain - an era referred to at the time as the New Elizabethan age. Together with your Thru'penny Bit, you will also receive the official Collector Presentation Folder, which stores and displays your coin safely and elegantly. It includes the Certificate of Authenticity guaranteeing the specifications. Together they provide important historical background information about British heritage coins. Normally £2.95, it is yours FREE of charge. One unfortunate consequence of this exceptional offer is that we expect demand to be substantial, so regrettably there must be a limit of one coin per household. You are among a limited number of The London Mint Office’s customers with access to this offer. If you act now you can secure this beautiful coin, the last of its kind, for just £9.95 (P&P is FREE) and SAVE £20.00 today. I would like to secure a £20.00 saving and order my last-ever Thru'penny Bit for only £9.95.